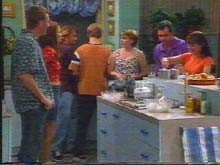 Along with Numbers 24 and 26, Number 28 has been integral to Neighbours since episode one. Originally owned by Bank Manager, Des Clarke, the house was decorated with white walls with furnishings including a pink corner sofa and red curtains. In 1990, Des sold the house to builder, Doug Willis, and moved to a small flat. The Willis family bought with them new furniture, however the house remained roughly the same until the family cut down the pillar between the hallway and the dining area was to half it's original size, forming a bench. The house was redecorated the following year with a peach colour scheme. 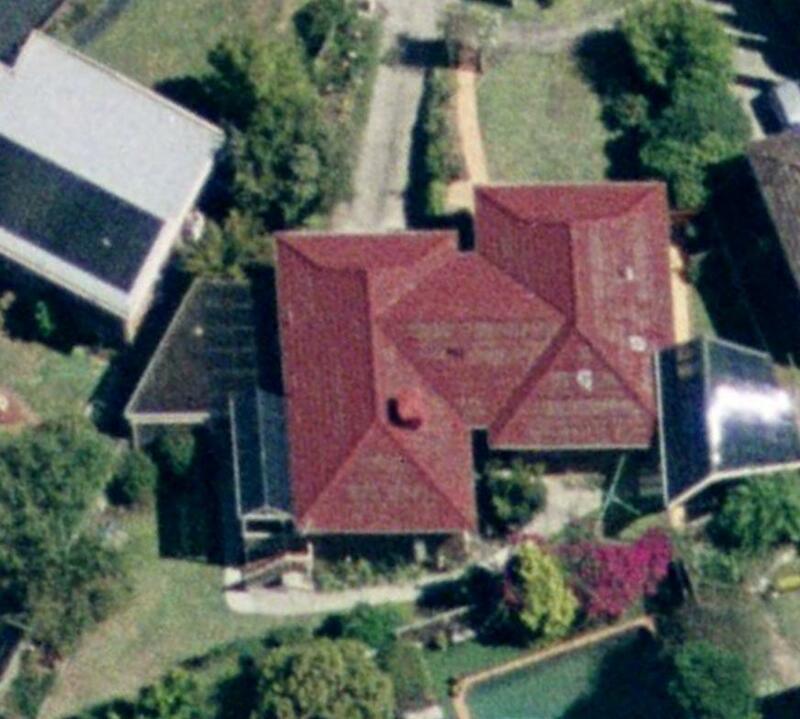 Following the Willis' family departing for Darwin in 1994, the house was bought at auction by Dr. Karl Kennedy, without consulting his wife, Susan. By the time the Kennedys moved in, the house had been completely redecorated in biscuit and cream tones. The Kennedys brought with them traditional furniture with a wooden dining table and wooden framed sofas. In 1996, the remaining segment of the pillar was demolished, with no on-screen explanation; however the house was redecorated completely by son Malcolm with cream woodwork and turquoise walls. The kitchen island unit was also moved so that it overlooked the lounge area rather than the dining area. In 1999, the Kennedys hired professional decorators to give it a new look with a green/grey stippled effect on the walls, with a biscuit tone around the fireplace and peach woodwork. New blue sofas replaced the old brown ones and the beige curtains changed to dark pink. A new dark wood style front door with leaded glass was added in 2001 after the Kennedys won a raffle at the High School. In early 2004, despite being in the midst of their marriage breaking down, Karl and Susan found the time to purchase and install new cream curtains, with no on-screen explanation. Susan received the house in the divorce settlement from Karl in 2004 and hired Gino Esposito to completely revamp the house in early 2005, with a light green colour scheme with yellow tiles on the fireplace and kitchen island, with white wooden shutters added to the windows and new lime green doors on the kitchen units. A new beige corner sofa was installed and a black dining suite. In 2010, the island unit of the kitchen moved back to the original position with no onscreen explanation. The kitchen was replaced almost entirely in 2011 with new units and worktops. The oven also moved position, whilst the fridge placed diagonally following alterations to the back wall, again with no explanation. The existing sofa was also changed to a chocolate brown corner sofa. As the Kennedys considered divorce in 2013, Karl suggested that he buy out Susan's half of the house, suggesting that they now have joint ownership once again. It was also confirmed that they own the house outright, with no mortgage. Later that year, after Holly Hoyland spilt nail varnish on the corner sofa, the Kennedys replaced it with two new green sofas, also replacing the black dining chairs with the green fabric covered chairs from Susan's old apartment, also changing some of the artwork. 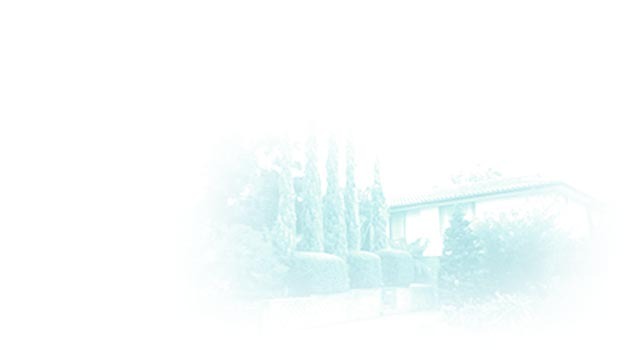 • The house used for the exterior of Number 28 is 5 Pin Oak Court, Vermont South, Melbourne, Victoria, 3133. • When filming exterior scenes, the house number is covered over on the mailbox by a sticker and the number 28 is added. • In 2001, the owners of the real property on Pin Oak Court added a new front door with leaded glass, which was duplicated on the studio interior. • The portrait of Malcolm, Libby and Billy Kennedy which hangs above the fireplace was painted on the show by Helen Daniels, who Karl commissioned to create it as a present for Susan's birthday. • For many years, the backcloth seen through Number 28's kitchen window depicted Number 26, which is housed on the other side of the property! 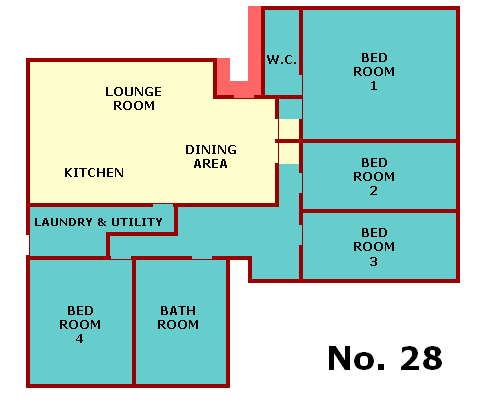 Please note: Due to studio and production constraints, alterations are often made to the layout of rooms/sets. Thus, the above illustration is intended as a plan based on the architecture of the actual houses on Pin Oak Court, and the various replicated interior layouts that have appeared on-screen over the years. Blue sections show areas which are rarely, if ever, shown on screen.